Do you always know if and when you’re being spammed? Sometimes, it’s hard to tell. 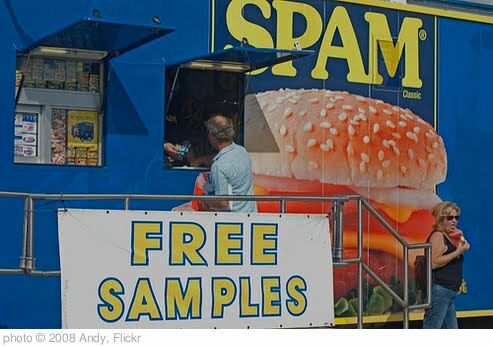 It has become so prevalent in our daily lives that I am writing a 4-part series, starting this week on spam, what it is, how do you recognize it and what are the best ways to manage it. First, what exactly is spam? We experience spam everyday, but what is it? According to Wikipedia, Spam is the use of any electronic messaging system that sends bulk messages indiscriminately. In 2011, the estimated figure for spam messages is around seven trillion. Fraud and lost productivity are the costs of this illegal activity and are largely borne by the public as a whole. Although originally referred to as the sending of unwanted emails, the use of the term has now broadened to include other media like: instant messaging, forums, search engines, blogs, wikis, mobile phones, and social networking sites. Spam messaging ranges from openly blatant messages that ask you to send money to a foreign country for some reason or another, to phony ads for Viagra, to cunningly difficult to detect messages that contain embedded links. Most of us are used to seeing spam emails and can easily recognize them because the people that sent them are either unknown to us or the messages sent are completely out of character for these people. As we enter the larger world of social networking, forums and blogging the people we interact with, by design, are not necessarily known to us. Spotting spammers is becoming more difficult. There is no ‘one size fits all’ for detecting spam. In the next three weeks, I’ll break down how spam can change, depending on the venue, and what you can do about it. There is a lot to cover on this topic, and as things keep changing, it becomes more important everyday to keep up to date with what is going on in the world of spam. https://socialenergizer.com/wp-content/uploads/2014/10/SE-logo-type-web.png 0 0 Lynn https://socialenergizer.com/wp-content/uploads/2014/10/SE-logo-type-web.png Lynn2011-08-03 17:28:082011-08-03 17:28:08Spam, Not The Ham. How Do You Recognize It?